UniEuk | EukBank v1.0: Last Call! 01 Feb EukBank v1.0: Last Call! The launch of UniEuk’s EukBank v1.0 is shaping up to be a great success. So far about 100 V4 18S rDNA BioProjects (from over 200 co-authors) have been submitted to the EukBank datahub at ENA, representing over 15,000 samples / 10 billion V4 reads. The datasets cover a broad range of environments, both marine (surface to deep sea and sediments, coastal to open ocean) and terrestrial (from many distinct habitats and latitudes: urban environments, altitude or acidic lakes, cultivated or undisturbed soils, etc.). To our knowledge this will be the largest homogenous metabarcoding dataset to date and an ideal playground to explore the extent of eukaryotic diversity. We are offering a final deadline extension to February 28, 2018, for contributors to include published or unpublished V4 18S rDNA datasets in the starting version of EukBank and get co-authorship on a major publication assessing global protist biodiversity and finally placing protists on the front stage of planetary ecology. If you haven’t done so yet, please take action now – submit your V4 18S rDNA datasets (official invitation letter here / submission guidelines here) and forward this call to all your collaborators! EukBank: a tool to organize and explore total eukaryotic diversity. 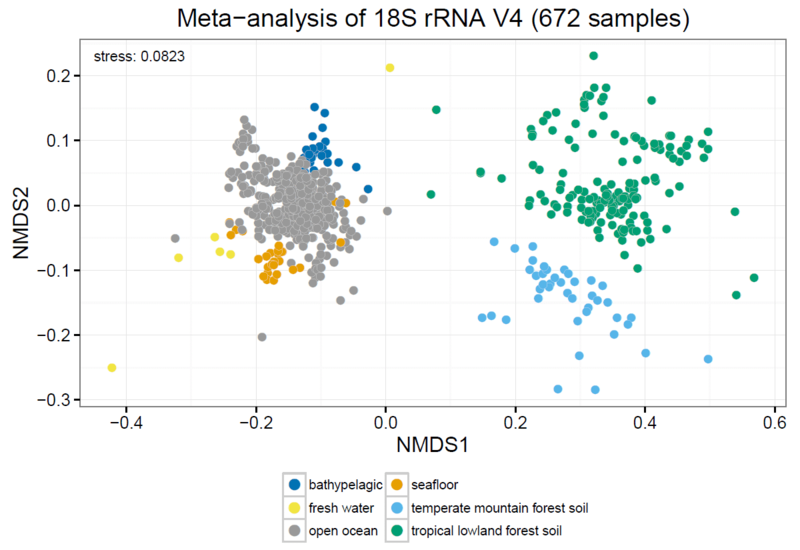 Preliminary meta-analysis of eukaryotic community similarity (V4 rDNA/RNA data) from 672 samples from marine sediments and plankton, abyssal waters, soils from tropical and mountain forests, fresh water, etc. Note the overall structuring of communities by biomes, and the much greater community differentiation in terrestrial ecosystems, as compared to the world oceans.